Dave Shorett has lived and fished in Washington all his life. After the successful publication of his Olympic Mountains Fishing Guide in 1996, praised by the Bremerton Sun as "The most complete and accurate guide to fishing in the Olympic Mountains" Shorett followed up with guides for other regions of the Northwest: Mt. Rainier & South Cascades Fishing Guide (1998); Washington's Central Cascades Fishing Guide (2001); and Grand Teton Fishing Guide (2004). Dave Shorett's books are considered the definite guides for their respective areas and include lots of information on fishing technique, access and hiking directions when necessary, as well as maps and photographs. 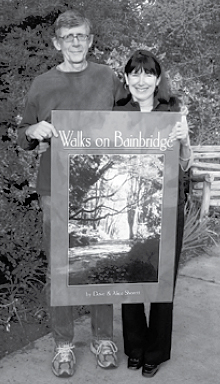 Dave and Alice Shorett's Walks on Bainbridge (2006) is a perfect companion book for Bainbridge Islanders and visitors alike. In it, the Shoretts describe 21 different walking routes on the island, varying from one mile to round trips of 10 miles and more. Maps, black and white photographs, specific directions, as well as distances and descriptions for each walk allow hikers of all ages to enjoy the trails and backroads of the island. Even veteran hikers will find a route on the list they have not walked before. Best of all, no matter which trail you pick, you are likely to be surrounded by plenty of trees, greenery, and great views of Puget Sound. All proceeds from the sale of the book are donated to the Bainbridge Island Land Trust.